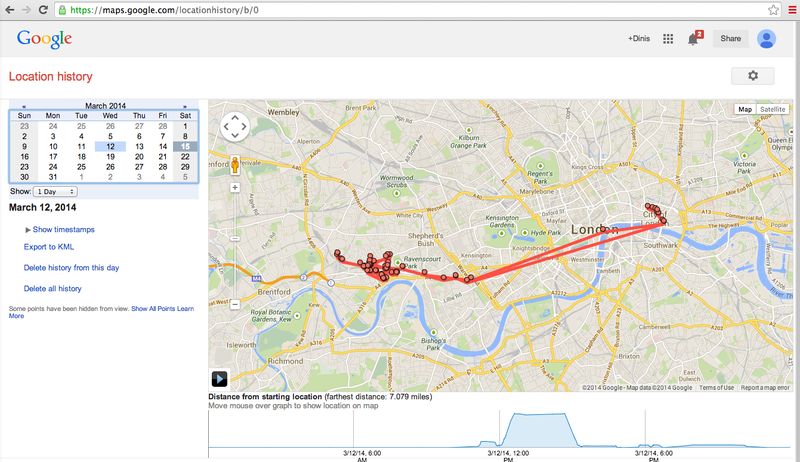 Today, I was looking at my Google Dashboard 'Account Activity', when I noticed the 'Location Tracking' section, which when I realised what it really meant, was quite freaky (and Big Brotherish). The good news is that at least Google exposes this information, and provides a way to say 'no please' (which as you can see below I exactly what I did). What would be really good/important, is if everybody that currently holds/collects this type of data (from other businesses/startups, telecom companies, GCHQ/NSA/Other-3-letter-gov-agency, XSS infected websites, owners of compromised browsers, etc...) would at least expose the fact that they are collecting and storing it (ideally there would also be a way to op out). Another worrying behaviour that missing from the Google Dashboard is the mapping of 'who has current access to this information' and 'who had access to it in the past (both human and bots)'. This is relevant not just for Location Tracking data, but also for the other types of data/information/knowledge Google stores about me (and you, and your kids). Of course that the fact that I asked Google not to track this information (and that they don't show it to me anymore), doesn't mean that they still not capturing it. Ironically given the current 'everybody is potentially guilty' mentality of the security agencies today, I bet that asking for the location data NOT to be stored, is seen as a 'red flag' and most likely will meant that others WILL indeed start tracking my location (if they are not already). The reality is that the capability to capture this information continues to be there, and this is just another step in making the world described in the Circle book a reality. If you have not read this book, YOU HAVE TO DO IT, since it really shows an always-on reality that we are all (in the technology/programming world) are helping to create. Opening it showed a really comprehensive list of locations I had been in the last month (with very regular data captures).